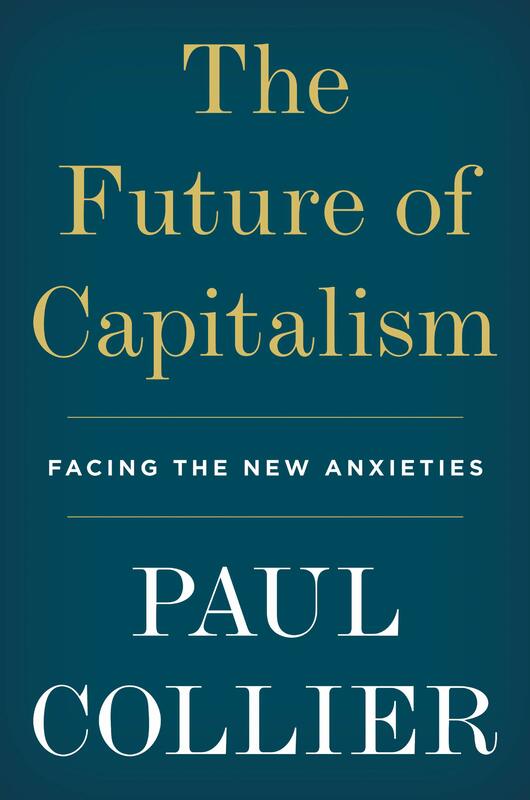 Capitalism has lost its way, argues Paul Collier of Oxford University in his new book, The Future of Capitalism: Facing the New Anxieties. Peter Vanham, lead writer for the World Economic Forum, offers his views on the book in the following review. Should Amazon reconsider moving to New York? According to polls, most New Yorkers would answer that question with a resounding “yes.” But ask Paul Collier, a veteran economics professor from Oxford, and he’d say “no way.” It would amplify New York’s “agglomeration” effect and deepen America’s divides, he believes. We would be better off putting higher taxes on high-earning workers in cities like New York and on big companies like Amazon, while promoting the old industrial heartland. So what makes Collier outspoken on the matter? After decades of focusing on developing countries, Collier decided to move his attention to Western economies. In The Future of Capitalism, his new book, he links the Amazon case to a much bigger economic story. Since about 1980, he says, “big divergences have occurred [in Western economies] which are new and very dangerous,” driven by two major economic processes. They should make us think twice about cases like Amazon’s. The first major process is that of technological innovations. We’re coming up with innovations that make us more productive, Collier says, but they require individuals getting higher education and acquiring specialist skills. It leads to a “rising escalator” for educated classes and to a clustering of skills in centers of knowledge, which in turn produces bigger and bigger agglomerations like London or New York. It is the return of Paul Krugman’s “new economic geography,” with a vengeance. The other process is globalization, and that is leading to a “downward escalator” for manual workers. “Globalization is good on average,” Collier says, “but my profession owes the world a big mea culpa.” Economists painted a much too idealistic picture of it, he says, where everyone would be better off because the whole would be better off. But major redistribution policies were necessary to ensure that globalization worked for all, and they simply didn’t happen. Instead, this mix of raw economic processes produced a “pattern of winners and losers.” It led to big gains for a handful of big cities, like London, New York and the Bay Area, where educated elites reap an ever-larger share of incomes, and where citizens condescendingly look at the countryside. And it led to big losses for the unskilled in the provinces, like in his hometown of Sheffield, which saw its 700-year-old steel industry killed in less than a decade in the 1980s, or the industrial Midwest in the U.S. Sadly, our political leaders did not do anything about it. Indeed, the “social democracy” that emerged in the Western “Golden Age” between 1945 and 1970 eroded because of the inadequate answers of populists and ideologues. On the right, free-market ideologues and libertarians promoted greed and purposeless profit-seeking. It allowed wealth to be accumulated in the hands of the few, while denying vast groups of people of a chance to earn a decent living. And on the left, politicians reduced citizens to consumers. If the “utility” of society was increased with a welfare handout, all was well. No effort was done to promote meaningful work for those left behind by technologic change. That was disastrous, Collier believes, because people are hard-wired to want to have a purposeful and social life. Making matters worse, he argues, proponents of “identity politics” advocated for more rights for minorities, without also promoting reciprocal obligations. This led to a period of 40 years, starting in the early 1980s, Collier argues, where the three crucial building blocks of society, the national state, the company, and the family, saw their respective roles altered or reduced for the worse. The individual replaced the family as the core unit of society. The community-drive company lost out to the profit-seeking one, and the national state became a giant with feet of clay. It is in this broader context that the Amazon discussion and many others play out. To fix our society’s ills, Collier favors what appear to be socially conservative solutions: restoration of the family as core unit instead of the individual, for instance, or less identity politics that put minority rights front and center. He also favors stricter immigration policies to maintain a stronger national identity, and therefore a higher buy-in for taxes and redistribution. But would the metropolitan avant-gardists ever buy into such a cultural contra-reformation? I doubt it. Perhaps the more practical solutions he offers, then, are those that focus more on rebalancing capitalism, and this is where his analysis becomes relevant for Amazon and New York. If you can’t stop the clustering of highly skilled workers in the metropolis, he writes, why not tax their work at a higher rate, and redistribute the revenues to workers in the less developed areas? It is thanks to all citizens that a social fabric is strong, and a metropolis can survive and thrive. All thus deserve a piece of the pie in return. To solve the metropolis-province divide, Collier suggests, why not encourage those Big Tech companies that are big enough to pursue an enlightened self-interest route? Set up shop in a former industrial town instead of in London or New York, he proposes. In this case, some tax incentives would make sense, since the pioneering of a new agglomeration in a city that would not otherwise have it would significantly increase its economic prospects. Have Amazon invest in Detroit or Baltimore. As for Amazon’s specific case, Collier made a prediction even before the company made its decision on an HQ2 — and then reversed it: “The company is sufficiently big to revive a broken city, and sufficiently ruthless to extract these benefits for itself,” he wrote in 2018. Touché. And it makes an important point: Think of Amazon what you like, but remember that its HQ2 decision is playing out in a broader economic reality. Shouldn’t we all bear in mind this reality a bit more before picking sides? Collier offers many more recommendations, but in the end his book is most interesting for the U.S. and parts of Europe. This is a guide to the next stage of capitalism from a professor rooted in a country still struggling to escape the legacy of the first industrial revolution. For other countries, the book is less applicable. In the case of parts of continental Europe, how do you tax Big Tech and large metropoles when you don’t have any? And do China and other Asian countries really have the same issues as the U.K.? That doesn’t take away anything from the monumental economic policy contributions of The Future of Capitalism. The U.K. and the U.S. were the champions of previous waves of capitalism. If they want to thrive in the next one, their leaders would do well to read it, and leave behind their ideologies when crafting policies for the 21st century. Amazon’s search for a new HQ2 may be over, but in the next few years, similar challenges undoubtedly will return — we had better be prepared for it.